Andrea Luigi of Assisi was apparently known as l’ Ingegno (the talented or ingenious) in his lifetime: a receipt in the archives of Assisi refers to him as “Ingegno di Maestro Allovisi” . His family owned Palazzo Aluigi (16th century) in Via San Paolo (see Walk III), and he presumably lived there. According to Giorgio Vasari, l’ Ingegno was the most promising of the pupils of Perugino, whom he assisted in the Sistine Chapel of the Vatican Palace, and with whom he collaborated in the Collegio di Cambio, Perugia and at the Portiuncula (see below). Vasari claims that his career was cut short by blindness, and that he died at the age of 86. L’ Ingegno is well-documented as a prominent citizen of Assisi: his name occurs frequently in the archives of Assisi in the period 1505-11, where he acted on various occasions as procurator, arbitrator, auditor and papal treasurer. However, only one surviving document refers to him as an artist: in 1484, “magister Andreas Aloysii” received payment from the Commune in 1484 for frescoes of the arms of Pope Innocent VIII on some of the city gates and in Piazza del Comune. A panel (ca. 1490) in the National Gallery, London, which depicts the Madonna and Child is signed “A. A. P.”, might be his: however, there is no certainty that this signature was his. The lack of surviving, securely attributed works means that there is a considerable degree of uncertainty about his artistic career. 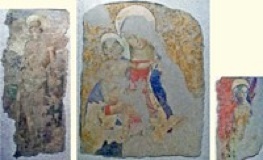 This poorly preserved fresco of the Madonna and Child in a landscape under an arch of seraphim came from Porta San Giacomo and is now in the Pinacoteca Comunale. It was first documented in 1859, with an attribution to “Andrea Eloigi”, and the work is fundamental to any attempt to assemble a catalogue of his surviving works. As noted above, Giorgio Vasari recorded that l' Ingegno had participated in Perugino’s work in Assisi, by which he presumably meant in the execution of this fresco on the exterior wall of the choir of the Cappella della Portiuncula. This fresco above the entrance in the Chiostro Verde of the nunnery of Sant’ Anna, has recently been attributed to Andrea d' Assisi. The date is inscribed as graffiti on the fictive column to the right. This fresco, which is illustrated in the site of the Fondazione Federico Zeri, was found in 1653, when the Gualterio family removed the altarpiece of the Cappellina di Santa Maria Maddalena in the Cappella Nuova of the Duomo. It was subsequently detached and moved to the chapel in the family palace. It was documented among the family’s possessions in 1741. It was sold in 1872 and found its way to the Museum of Fine Arts, Leipzig, where it was destroyed in the bombardment of 1943. The fresco, which was long thought to be the work of Luca Signorelli, has recently been attributed to Andrea d' Assisi, who was documented at work with Perugino in the Cappella Nuova in 1491. It is possible that he painted this fresco in a bid to secure the commission to complete the decoration of the chapel. If so, it seems that the initiative failed. According to Giorgio Vasari, Andrea d’ Assisi, l' Ingegno was the main assistant of Perugino in relation to the fresco cycle in the Sala dell’ Udienza of the Collegio di Cambio. He claimed that “some very beautiful figures by his hand” could be seen there. This detached fresco of the Madonna and Child with SS Jerome and Bernardino of Siena is from the ex-Oratorio di San Bernardino. It was detached early in the 20th century, and the date 1503 was probably inscribed at that point. The fresco, which is now in the Pinacoteca Comunale, is attributed to l’ Ingegno, who might have been involved in Pintoricchio’s work in the Cappella Bella at this time. These panels came from a polyptych that was probably originally commissioned for the high altar of Santa Maria Maggiore. It was dismembered at an unknown time and its panels were then used on individual altars. This central panel and one of the predella panels were stolen in 1970, but they were fortunately recovered in 1992. Most of the panels are now in the Pinacoteca Comunale, although the central panel there is replaced by a photograph: the original is in the Cappella dei Canonici, Santa Maria Maggiore. Following a recent restoration, the side panels and predella panels have been attributed to the Maestro dell’ Assunta di Amelia. The central panel, which depicts the Madonna and Child enthroned, was presumably also his work. However, it was extensively repainted in ca. 1500, although the throne seems to be largely original. Its present frame was probably executed at the time of the over-painting, which has been attributed to Andrea d’ Assisi, l’ Ingegno.